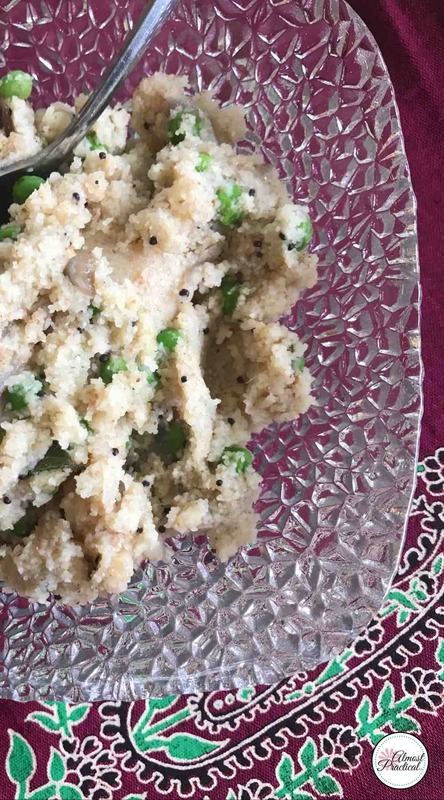 What is an upma recipe, you ask? Upma is a traditional Indian dish made with cream of wheat and vegetables. It is best for breakfast, lunch, or a light dinner. There are many variations, and you can experiment as you go along. I have split the recipe into required ingredients and optional ingredients. You can find all of the required ingredients at a regular grocery store. But if you want to get a little more exotic, you can toss in some of the optional items. To find a few of the items on the optional list, you may need to make a trip to an Indian grocery store. 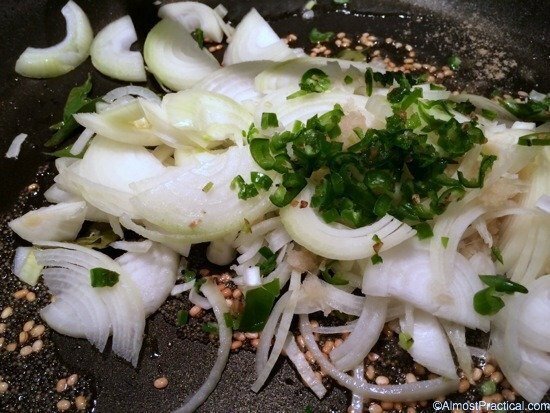 Before you begin, cut 2 medium onions into thin slices. Chop up two long green chili peppers. (These are optional and add a little heat to the recipe. If you don’t have long green chilies then another fresh, spicy pepper will do. Just don’t use a pickled variety from a jar. It won’t taste right.) Also grate 1 tablespoon of fresh ginger. This upma recipe begins with 2 cups of cream of wheat. If you get it at an Indian grocery store it is called sooji. Dry roast the cream of wheat for 3 to 5 minutes in a large skillet. Then set it aside. Pour two tablespoons of oil into a nonstick skillet. Add 1 teaspoon of whole, black mustard seeds. 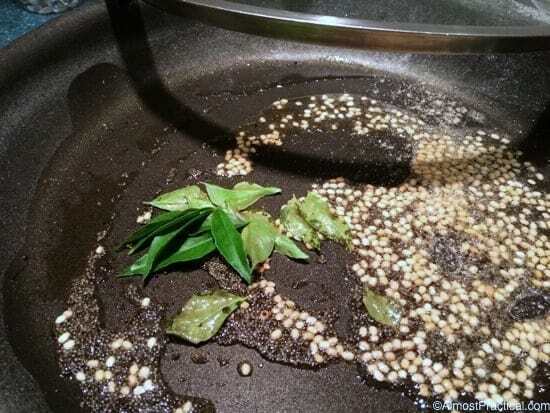 Cover the skillet, leaving the lid slightly ajar until the mustard seeds have popped. Be careful if you haven’t done this before. When you put mustard seeds in hot oil, they start popping all over the place. 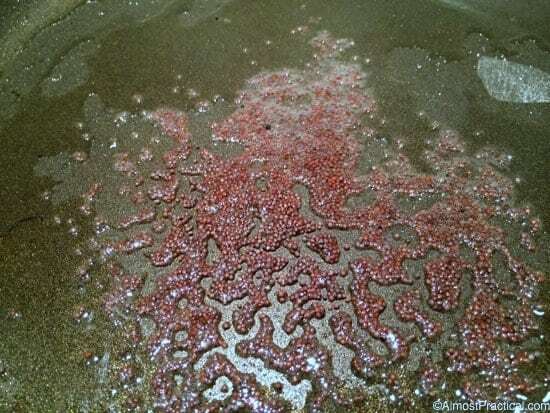 If you don’t use a lid, they will spatter all over your stove – and you. Because they are hot, it can hurt. I usually, turn off the heat once they start to pop so they don’t burn – because if you leave them on the stove too long, they will burn. Especially if you are using an electric stove. In the case of electric, remove the skillet to a cool burner once the popping begins. 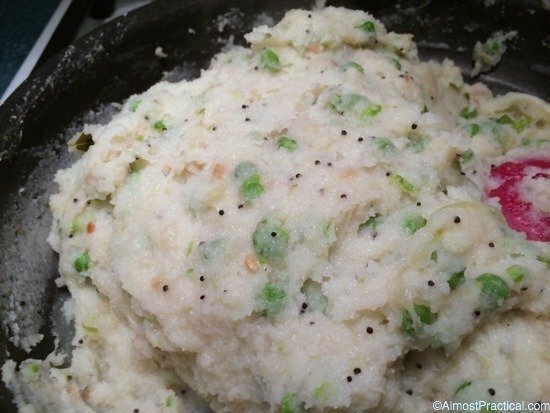 The following ingredients are available at Indian grocery stores, but are completely optional for making this upma recipe. If you have split white urad dal on hand, add 2 teaspoons to the popped mustard seeds. Also add 10 to 15 fresh curry leaves and 1/8 teaspoon of hing. Sauté these for less than a minute on medium low heat until the urad dal starts to brown. Now add all of the fresh vegetables that you chopped previously (onions, ginger, and green chills). Sauté these for about 5 minutes. Then add 1 cup of frozen peas. Seriously, just toss them in straight out of the freezer. No need to thaw. Continue to cook until the onion becomes translucent and the peas are no longer frozen. If it starts to stick turn the heat down slightly and add a little water. Again, using a nonstick skillet is best. When the vegetables are ready, add the cream of wheat that you set aside previously, and 1 teaspoon of salt (you can add more later depending on your taste preference). Mix it with the vegetables. Now gradually add 4 cups of water while you stir the mixture constantly, to avoid lumps. That darn cream of wheat. Also squeeze in the juice of 1/2 a large lemon. Or 1 small one. Or use 1 to 2 teaspoons of lemon juice. Start with one, taste it, and add more if you prefer. If the upma recipe is too thick, add a little more water as needed. Add a little chopped, fresh cilantro for flavor and garnish – and serve. A great side dish for the upma are those little cocktail samosas (available in the freezer section of many stores including Costco and Trader Joe’s). 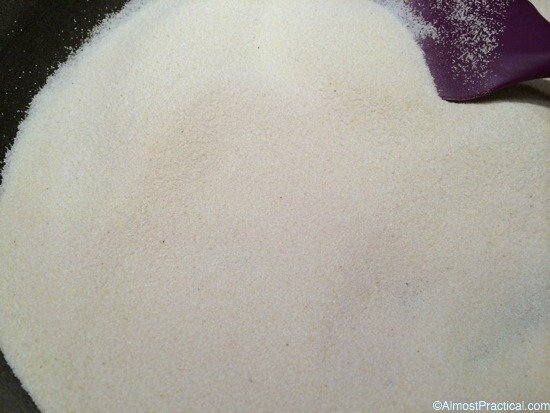 Remove cream of wheat from the stove. Heat the oil in a medium sized skillet or shallow sauce pan. When oil is hot add the mustard seeds and wait until they stop popping - about a minute. Turn down the heat or turn it off if you have to - just be careful of the popping seeds. Add the asafetida, urad dal, and curry leaves. Sauté for about 2 minutes until the urad dal starts to brown. Then toss in the green chilis, curry leaves, grated ginger, and the sliced onions. 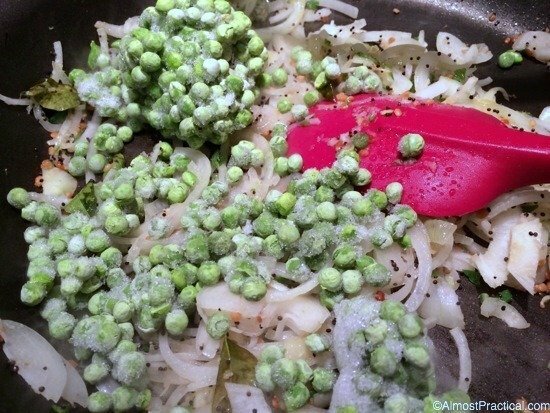 Add the frozen green peas (no need to thaw). Sauté over medium heat for about 5 minutes or until the onion becomes translucent. Add the dry roasted cream of wheat to the vegetables. Gradually add the 4 cups water, stirring constantly to avoid lumps. If the upma is too thick, add a little more water to achieve the right texture. I started adding recipes to my blog as a way to document some of my favorites. While this blog isn't a traditional food blog – I quickly realized that my food photography needed a little help. That is actually an understatement – more like a lot of help. Thankfully, I found Food Blogger Pro – a comprehensive course on how to start a food blog. And slowly I have been updating some of my older recipes with new photography. Here is the before and after for this recipe. What a difference, don't you think? If you have been making your own version of this Indian dish – what ingredients do you typically add?